Nobody Reads in LA has a new home. In anticipation of my upcoming John Fante: Dreams of Bunker Hill tour, we will be hosting the inaugural meeting of Nobody Reads In LA at Lost Souls Cafe in downtown Los Angeles. 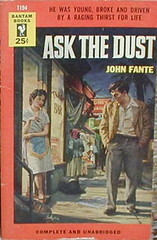 The book for discussion, Ask The Dust. Nico, Kim and I will arrive at 6:30 to jump start the event, and we officially begin at 7:00.